"Hydro-storage" redirects here. For storage of water for other purposes, see Reservoir. Pumped-storage hydroelectricity (PSH), or pumped hydroelectric energy storage (PHES), is a type of hydroelectric energy storage used by electric power systems for load balancing. The method stores energy in the form of gravitational potential energy of water, pumped from a lower elevation reservoir to a higher elevation. Low-cost off-peak electric power is used to run the pumps. During periods of high electrical demand, the stored water is released through turbines to produce electric power. Although the losses of the pumping process makes the plant a net consumer of energy overall, the system increases revenue by selling more electricity during periods of peak demand, when electricity prices are highest. Pumped-storage hydroelectricity allows energy from intermittent sources (such as solar, wind) and other renewables, or excess electricity from continuous base-load sources (such as coal or nuclear) to be saved for periods of higher demand. 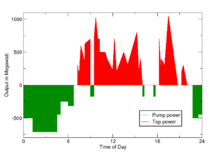 Power distribution, over a day, of a pumped-storage hydroelectricity facility. Green represents power consumed in pumping; red is power generated. At times of low electrical demand, excess generation capacity is used to pump water into the higher reservoir. When there is higher demand, water is released back into the lower reservoir through a turbine, generating electricity. Reversible turbine/generator assemblies act as pump and turbine (usually a Francis turbine design). Nearly all facilities use the height difference between two natural bodies of water or artificial reservoirs. Pure pumped-storage plants just shift the water between reservoirs, while the "pump-back" approach is a combination of pumped storage and conventional hydroelectric plants that use natural stream-flow. 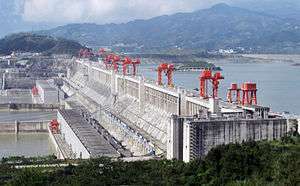 Plants that do not use pumped-storage are referred to as conventional hydroelectric plants; conventional hydroelectric plants that have significant storage capacity may be able to play a similar role in the electrical grid as pumped storage, by deferring output until needed. Taking into account evaporation losses from the exposed water surface and conversion losses, energy recovery of 80% or more can be regained. The technique is currently the most cost-effective means of storing large amounts of electrical energy on an operating basis, but capital costs and the presence of appropriate geography are critical decision factors. The relatively low energy density of pumped storage systems requires either large flows or a large differences in height. The only way to store a significant amount of energy is by having a large body of water located relatively near, but as high above as possible, a second body of water. In some places this occurs naturally, in others one or both bodies of water were man-made. Projects in which both reservoirs are artificial and in which no natural waterways are involved are commonly referred to as "closed loop". This system may be economical because it flattens out load variations on the power grid, permitting thermal power stations such as coal-fired plants and nuclear power plants that provide base-load electricity to continue operating at peak efficiency (Base load power plants), while reducing the need for "peaking" power plants that use the same fuels as many base-load thermal plants, gas and oil, but have been designed for flexibility rather than maximal thermal efficiency. 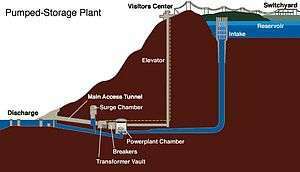 Hence pumped storage systems are crucial when coordinating large groups of heterogeneous generators. However, capital costs for purpose-built hydrostorage are relatively high. Along with energy management, pumped storage systems help control electrical network frequency and provide reserve generation. Thermal plants are much less able to respond to sudden changes in electrical demand, potentially causing frequency and voltage instability. Pumped storage plants, like other hydroelectric plants, can respond to load changes within seconds. 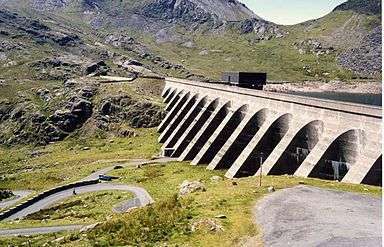 The upper reservoir (Llyn Stwlan) and dam of the Ffestiniog Pumped Storage Scheme in north Wales. The lower power station has four water turbines which generate 360 MW of electricity within 60 seconds of the need arising. The first use of pumped storage was in the 1890s in Italy and Switzerland. In the 1930s reversible hydroelectric turbines became available. These turbines could operate as both turbine-generators and in reverse as electric motor driven pumps. The latest in large-scale engineering technology are variable speed machines for greater efficiency. These machines generate in synchronization with the network frequency, but operate asynchronously (independent of the network frequency) as motor-pumps. The first use of pumped-storage in the United States was in 1930 by the Connecticut Electric and Power Company, using a large reservoir located near New Milford, Connecticut, pumping water from the Housatonic River to the storage reservoir 230 feet above. The important use for pumped storage is to level the fluctuating output of intermittent energy sources. The pumped storage provides a load at times of high electricity output and low electricity demand, enabling additional system peak capacity. In certain jurisdictions, electricity prices may be close to zero or occasionally negative (Ontario in early September, 2006), on occasions that there is more electrical generation than load available to absorb it; although at present this is rarely due to wind alone, increased wind generation may increase the likelihood of such occurrences. It is particularly likely that pumped storage will become especially important as a balance for very large scale photovoltaic generation. In 2009, world pumped storage generating capacity was 104 GW, while other sources claim 127 GW, which comprises the vast majority of all types of utility grade electric storage. The EU had 38.3 GW net capacity (36.8% of world capacity) out of a total of 140 GW of hydropower and representing 5% of total net electrical capacity in the EU. Japan had 25.5 GW net capacity (24.5% of world capacity). In 2010 the United States had 21.5 GW of pumped storage generating capacity (20.6% of world capacity). PHS generated (net) -5.501 GWh of energy in 2010 in the US because more energy is consumed in pumping than is generated. Note: this table shows the power-generating capacity in megawatts as is usual for power stations. However, the overall energy-storage capacity in megawatt-hours (MWh) is a different intrinsic property and can not be derived from the above given figures. One can use pumped sea water to store the energy. In 1999, the 30 MW Yanbaru project in Okinawa was the first demonstration of seawater pumped storage. A 300 MW seawater-based project has recently been proposed on Lanai, Hawaii, and several seawater-based projects have recently been proposed in Ireland and Chile. Another potential example of this could be used in a tidal barrage or tidal lagoon. A potential benefit of this arises if seawater is allowed to flow behind the barrage or into the lagoon at high tide when the water level is roughly equal either side of the barrier, when the potential energy difference is close to zero. Then water is released at low tide when a head of water has been built up behind the barrier, when there is a far greater potential energy difference between the two bodies of water. The result being that when the energy used to pump the water is recovered, it will have multiplied to a degree depending on the head of water built up. A further enhancement is to pump more water at high tide further increasing the head with for example intermittent renewables. Two downsides are that the generator must be below sea level, and that marine organisms would tend to grow on the equipment and disrupt operation. This is not a major problem for the EDF La Rance Tidal power station in France. A new concept is to use wind turbines or solar power to drive water pumps directly, in effect an 'Energy Storing Wind or Solar Dam'. This could provide a more efficient process and usefully smooth out the variability of energy captured from the wind or sun. . In northern Chile, the Espejo de Tarapacá project is a power project of Valhalla, that combines solar and hydroelectric resources. The project takes advantage of the unique geographic characteristics of the Atacama Desert in order to build a 300 MW pumped storage hydroelectric plant that uses the Pacific Ocean as its lower reservoir and an existing natural concavity as its upper reservoir, and a 600 MW-AC solar photovoltaic plant that is located in the region with the highest solar irradiation in the world. The above characteristics minimize the environmental impact and the cost of the plant, which is USD 400 MM for the pumped storage and USD 900 MM for the solar power plant. The use of underground reservoirs has been investigated. Recent examples include the proposed Summit project in Norton, Ohio, the proposed Maysville project in Kentucky (underground limestone mine), and the Mount Hope project in New Jersey, which was to have used a former iron mine as the lower reservoir. 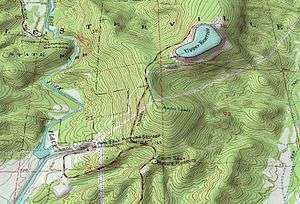 Several new underground pumped storage projects have been proposed. Cost-per-kilowatt estimates for these projects can be lower than for surface projects if they use existing underground mine space. There are limited opportunities involving suitable underground space, but the number of underground pumped storage opportunities may increase if abandoned coal mines prove suitable. Small pumped-storage hydropower plants can be built on streams and within infrastructures, such as drinking water networks and artificial snow making infrastructures. Such plants provide distributed energy storage and distributed flexible electricity production and can contribute to the decentralized integration of intermittent renewable energy technologies, such as wind power and Solar power. Reservoirs that can be used for small pumped-storage hydropower plants could include natural or artificial lakes, reservoirs within other structures such as irrigation, or unused portions of mines or underground military installations. In Switzerland one study suggested that the total installed capacity of small pumped-storage hydropower plants in 2011 could be increased by 3 to 9 times by providing adequate policy instruments. 1 2 "Energy storage - Packing some power". The Economist. 2011-03-03. Retrieved 2012-03-11. ↑ Yang, Chi-Jen. Pumped Hydroelectric Storage Duke University. Accessed: 12 February 2012. ↑ Energy Storage Hawaiian Electric Company. Accessed: 13 February 2012. ↑ "A Ten-Mile Storage Battery." Popular Science, July 1930, p. 60. ↑ "2003-2004 Electricity Review in Japan" (PDF). Japan Nuclear. Retrieved 1 September 2010. ↑ "Senator Wash". www.iid.com. Imperial Irrigation District. Retrieved 6 August 2016. Wikimedia Commons has media related to Pumped-storage hydroelectric power plants.